This Chinese take-out inspired dish is the perfect way to bring a family favorite to your own kitchen. 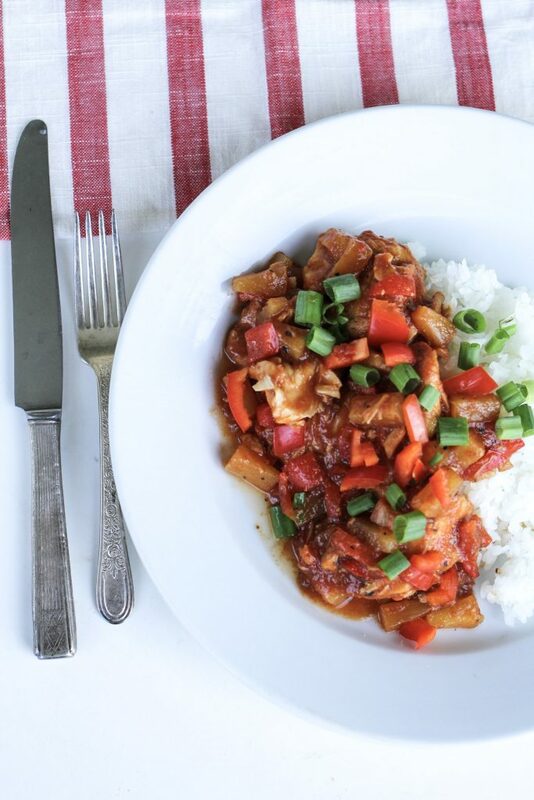 Slow Cooker Take-Out Homemade Sweet and Sour Chicken is made with sauce you whip up in a flash and all white meat. No deep fryer needed! 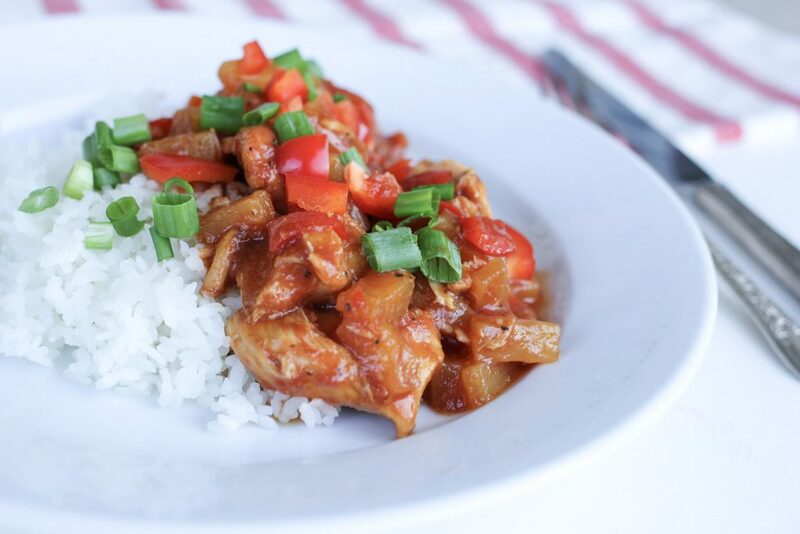 Take-Out Homemade Sweet and Sour Chicken is a great option if you love the flavor of sweet and sour chicken, but don’t love the price tag of ordering from a restaurant or the often used deep fried coating. 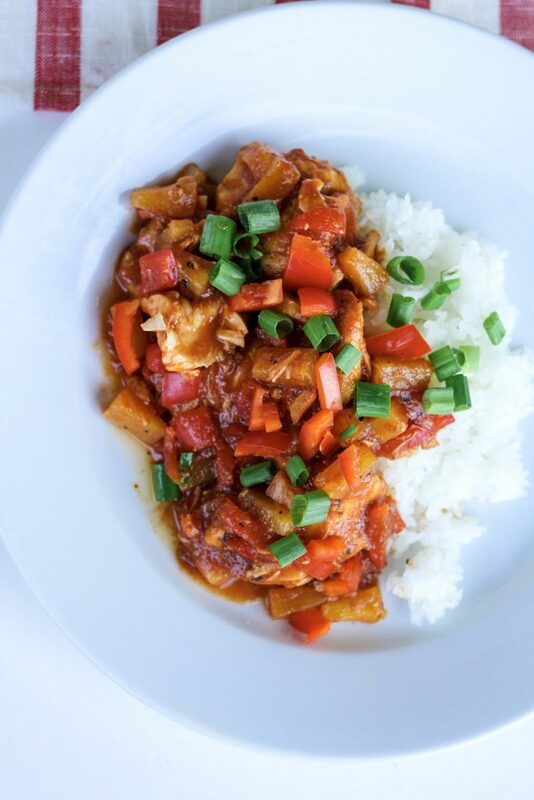 Some people refer to this dish as Hawaiian Chicken, but it reminds me of the sweet and sour chicken my dad used to pick up occasionally on his way home from work. 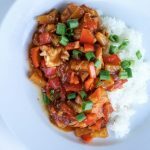 When I was working on this recipe, I tested it a few different methods for preparing in the slow cooker. I found the best way to avoid a watery sauce was to only add little of the sauce while cooking the chicken. The remaining sauce is added later, when the chicken is cooked, just before serving. I serve this dish with Slow Cooker Beef and Broccoli and love the combinations of colors and flavors of the two dishes together. Served with a pot of rice it’s the perfect meal for any night of the week. If you want to cook both dishes at once, and only have one slow cooker, you can cook one of the dishes in the oven on 275 to replicate the low setting. Make sure to tightly cover the dish so liquid does not escape. Next time you’re throwing a theme party, get some paper take-out containers , disposable chop sticks and a bag of fortune cookies. Dip the cookies in chocolate for dessert. Make a batch of Slow Cooker Beef and Broccoli and Take-Out Homemade Sweet and Sour Chicken. Ask your guests to bring other Asian inspired dishes for a simple, fun and affordable gathering. I know you’ll love this dish for any day of the week, or a party menu! Cut up chicken in to large chunks about 1x1 inch or into strips about 1/2 inch thick. Whisk together all of the sauce ingredients in a bowl. Remove 1/2 cup of the sauce and place in slow cooker. 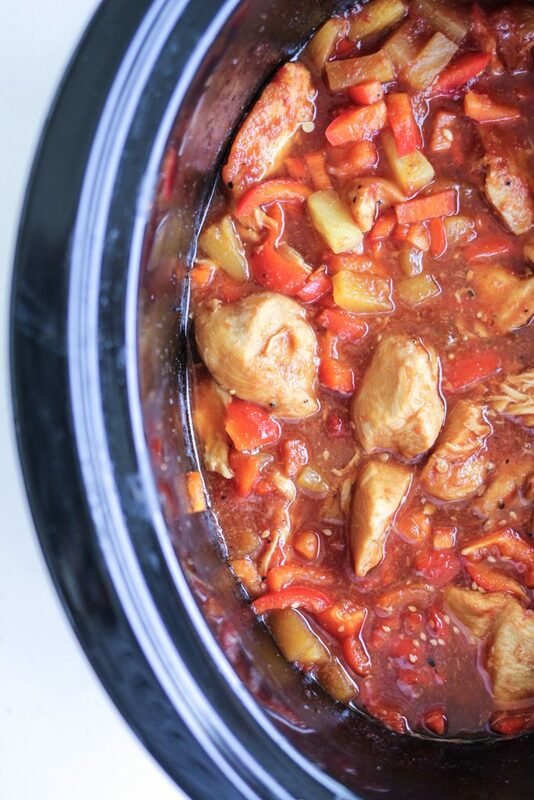 Place cut up chicken and chopped red pepper in slow cooker, mix with a large spoon and cover with lid. Turn slow cooker to high and cook for about 2 hours or about 4-5 hours on low. After cooking, add the remaining sauce and stir gently. Turn slow cooker to high and cook for an additional 15 minutes or until sauce is bubbly. Serve with rice. -If you would like the sauce to be a bit thicker, you may remove some of the sauce from either the cooked chicken in the slow cooker or add about 1 tablespoon of cornstarch to about 1/4 cup of cold water and whisk until smooth. Add this to the final sauce in the slow cooker during the last 15 minutes of cooking. You may also quickly stir fry the chicken pieces before adding to the slow cooker. to do this, place about 3 tablespoons of cornstarch to a ziplock bag, toss the chicken pieces, uncooked in the bag. Place about 1 tablespoon of oil in a non stick skillet and turn the heat to medium high. Stir fry the chicken just until no longer pink. Proceed with recipe as directed. -You may also add chopped onion, snow peas or other vegetables to this recipe as well. Stir fry any additional vegetables about 15 minutes before serving. Add to cooked chicken mixture in slow cooker. Heat until sauce is bubbly. Turned out yummy for us! Only problem was some burned edges of chicken…I guess because there wasn’t much liquid and I cooked it on high. My crockpot runs hot. Next time I’ll plan ahead! I had a question about the sauce. Do you reserve 1/2 cup sauce out of the slow cooker while it is cooking, or only put the 1/2 cup in to cook the chicken? And then adding the greater amount of sauce at the last 15 minutes? At what point is the pineapple added? Should the pineapple cook the whole 4 hours with the chicken or be added later? Sorry if this may seem obvious to some, but I need the clarification! Thanks! Sorry! I have responded to this comment 3 times, and for some unknown reason my reply won’t post! Yes, Melanie is correct on her comment above. Cook the chicken in the 1/2 cup of reserved sauce, then add the remaining sauce after the dish is cooked. The pineapple is in the sauce. You may add the pineapple with the chicken to cook if you’d like, but Im guessing it will think the sauce a bit. I made this tonight to take to someone for dinner. It was such a quick and easy recipe and tastes so good! In answer to Miki above, I put 1/2 cup sauce in the slow cooker with the chicken and peppers and then added the bulk of the sauce at the end. I added the pineapple to the sauce so some of it (whatever was in the 1/2 cup I pulled out) got cooked the whole 4 hours and some just the 15 minutes. I prefer the taste of cooked pineapple so I would probably add it all at the beginning next time. I did not get dinner in the crockpot as planned so I pulled out the instant pot and it was a hit! Pretty much followed the instructions, using the cornstarch method. Threw a little chicken broth in after sauting and with the sauce I added (maybe 1/2 C chicken broth) and also made sure there was not a lot of cornstarch clumped on the bottom of the pot (scraped the brown bits up and incorporated them in with the sauce and broth), set the pot to manual on high for 5 minutes and locked that lid in place. Left for a little league baseball game (which meant i used a natural release) and when I returned dinner was hot and ready to feed a hungry crew! Thanks for a yummy alternative to Chinese takeout! I should clarify, after adding the sauce it was going to cook in, I added the additional chicken broth to the pot. The reserve sauce didn’t have any extra chicken broth. I love to hear IP success stories like this one! What a great time saver. We can be watching little league while the Instant Pot is doing the work. Thank you for sharing your story and your tips for this recipe.